Laurenz Buhl and Calista. ©ManciniPhotos. Wellington, FL – December 22, 2015 – Laurenz Buhl and Calista, finishing in exciting fashion, topped a competitive class of 40 entries in the $25,000 Brazilian Court Hotel Grand Prix hosted at Palm Beach International Equestrian Center (PBIEC) on Sunday, December 20. Buhl, originally from Germany, but based in Wellington, FL for the winter season, piloted Calista, owned by Gotham Enterprizes, LLC, to the win, finishing the second round track in 37.004 seconds. 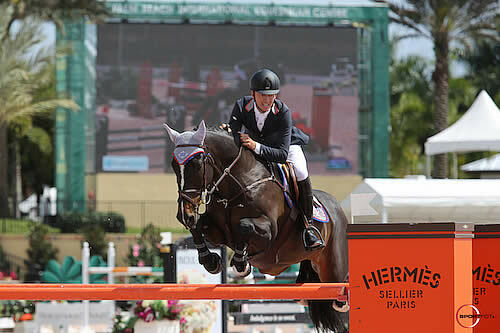 Liza Finsness of Wellington, FL and her own Shiver earned second place with a time of 38.385 seconds while Edward Levy of Neuilly, France and Rebeca LS, owned by Remarkable Farms LP, collected third place, crossing the timers in 39.541 seconds. Competition at PBIEC will resume on Wednesday, December 30, with the ESP New Year’s Show, which will host the $30,000 Nutrena Grand Prix on Sunday, January 3. Buhl carefully guided Calista, a 2006 Westphalian mare (Cornet Obolensky x Poesie) to one of four double clear trips in the class, setting a quick pace in the jump-off round that Finsness nor Levy could catch as they followed later in the order. Buhl, who is typically based in Germany for the majority of the year, enjoyed a solid first outing at PBIEC, riding a smart and efficient two rounds to secure the win. Guillerme Jorge of Brazil, who will also design the courses for the 2016 Olympic Games in Rio de Janeiro, built a difficult and technical track for the final grand prix class before the holiday break. Wintering in Florida has proved beneficial for Buhl, as he earned a win in the Artisan Farms Under 25 Series at WEF in 2015 aboard another Gotham Enterprizes LLC mount, River Dance Semilly, in the $25,000 Artisan Farms Under 25 Grand Prix Semi-Final. Peter Wylde of Lake Worth, FL piloted Paloma, a 2006 Holsteiner mare (Canaletto S x H Lila M) owned by Kathleen Kamine, to victory in the $10,000 AcuLife Open Stake at PBIEC on Friday, December 18. Wylde, an Olympic-team veteran, made quick work of the class, finishing nearly six seconds faster than second place finisher Luke Dee and Auckland De L’Enclos. Wylde and Dee secured the only two double clear efforts on the day. Wylde and Paloma captured the class with a time of 42.699 seconds, while Dee, of Wellington, FL, finished in second place with a time of 48.707 seconds. Emanuel Andrade of Wellington, FL completed the jump-off track in 41.817 seconds, with a single rail for a third place finish. Competition at PBIEC will resume on Wednesday, December 30, with the start of the ESP New Year’s Show. For more information and to view a full revised schedule, please visit www.pbiec.com. Laurenz Buhl and River Dance Semilly. Photos © Sportfot. Wellington, FL – March 6, 2015 – Friday evening of week nine at the 2015 Winter Equestrian Festival (WEF) featured the $25,000 Artisan Farms Under 25 Grand Prix Series Semi-Final, presented by Kingsland Equestrian, under the lights of the International Arena at the Palm Beach International Equestrian Center (PBIEC). Laurenz Buhl (GER) took the victory with Gotham Enterprizes LLC’s River Dance Semilly. Stephen Moore (IRL) placed second with Fantasy, owned by Oakland Ventures LLC, while Alise Oken (USA) and Hitchcock vd Broekkant were third. Douglas Elliman Real Estate is the title sponsor of week nine’s competition. WEF nine runs March 4-8, 2015, featuring the $372,000 FEI World Cup™ Grand Prix CSI-W 5*, presented by Douglas Elliman Real Estate, on Saturday, March 7. Several classes throughout the week will be live streamed at www.coth.com. Watch Saturday night’s grand prix beginning at 7 pm here – http://bit.ly/1FY5PkK. Sunday’s $85,000 Suncast® 1.50m Championship Jumper Classic will be shown live beginning at approximately 10:00 a.m. at http://bit.ly/18QxRVj. The Under 25 competition saw 34 entries with just two able to clear the challenging track set by Alan Wade (IRL) without fault. Buhl and Moore, both 22 years old, went head-to-head in the tiebreaking jump-off. First to go, Buhl and River Dance Semilly completed the short course in a fast time of 45.67 seconds, but dropped a rail at the final fence that left the win in the balance. Moore tried for a clear round, but also had a rail on course with Fantasy. His time was slower time in 45.78 seconds to put the pair in second place. Buhl first came to the United States to ride for Georgina Bloomberg’s Gotham Enterprizes two years ago and happily returned at the end of 2014 to spend his winter in Wellington. He showed River Dance Semilly for the first time in the under 25 class on the derby field during week six and was excited for the opportunity to compete the 10-year-old Selle Francais gelding (Kalaska de Semilly x Ulior des Isles) again under the lights. Buhl was disappointed to have the rail at the final fence in the jump-off, but he was thrilled to get the win in the end and took the experience in stride. Moore also had a good learning experience under the lights with his mount, Fantasy, a 10-year-old Hanoverian mare (For Pleasure x Acord II). Moore first came to Wellington last winter and returned to train with Darragh Kenny this year. Fantasy began the winter with a second place finish with Kenny in the Trump Invitational Grand Prix, presented by Rolex, and has since carried Moore throughout the under 25 series. The riders agreed that Alan Wade’s course was difficult, but fair, with many different challenges. For Oken and Hi Hopes Farm LLC’s Hitchcock vd Broekkant, it was the tight time allowed that placed the pair in third with one time fault on the first round course. With seven classes held throughout the WEF circuit, the Artisan Farms Under 25 Grand Prix Series, presented by The Dutta Corp. in association with Guido Klatte, gives young riders a valuable stepping-stone from the junior and amateur ranks to the grand prix level. The $50,000 series final will be held week 11 on Sunday, March 22. Andrew Ramsay (USA) and Shalanno Farms LLC’s Welfare got their win on Friday after several top finishes in the FEI world ranking classes at the 2015 WEF. The pair placed second in back-to-back FEI 1.45m classes in week seven’s CSI 5* competition, then settled for third place in Wednesday’s international 1.45m to begin this week’s CSI 5*-W. Friday afternoon, the pair proudly took the lap of honor for the $34,000 Spy Coast Farm 1.45m speed class against an impressive roster of worldwide competitors. Sixty-nine entries showed over Alan Wade’s (IRL) 1.45m track Friday afternoon with 13 clear rounds. Sixth in the order, Ramsay and Welfare set the winning time at 62.71 seconds. With a clear round aboard Spruce Meadows’ Quiz, Darragh Kenny (IRL) jumped into second in 63.15 seconds. Meagan Nusz (USA) and Amalaya Investments’ Vesuvius earned the third place prize with their time of 64.47 seconds. Ramsay has had Welfare, a 12-year-old Dutch Warmblood gelding (Pacific x Zortin), for two years. Ramsay also won the $8,000 1.45m jump-off class on Thursday with his mount Adamo van’t Steenputje. With a great season underway, the rider will continue to compete through the end of the WEF circuit before heading back to his farm in Holland for the summer. From California, Ramsay rode as a junior and took time off from the sport while he attended college. He is now developing his riding to the top level and hopes to return to Wellington again next winter. Also showing in the International Arena on Friday, the $6,000 Spy Coast Farm 1.40m Speed Challenge was held in a California Split with a one-two-three finish in Section A for Laura Chapot (USA). Chapot won the class aboard her own Bradberry and finished second and third respectively with Mary Chapot’s Zealous and Umberto. Daniel Zetterman (SWE) topped Section B with Gyllebo Farm LLC’s Chellana, with Wilton Porter (USA) and Sleepy P Ranch LLC’s Delinquent JX in second, and Heather Caristo Williams (USA) aboard Alexander LLC’s Wistful in third. On Friday morning, the pony hunters took over the Stadium Derby field for the $5,000 “Jump for the Children” Large Pony Hunter Classic. Instead of the classic sand ring, the ponies and riders competed out on the grass field over a derby style course built by designer Danny Moore. Out of a field of 13, Emma Kurtz piloted Dr. Betsee Parker’s pony, All My Love, to the blue ribbon. Kurtz had a dominating performance earning a score of 88 in the first round paired with an 87 in the second round for a grand total of 175. Taylor St. Jacques took home second and third place honors. Madeline Scully’s pony, Spot On, finished in second place with a total score of 167. Love and Logic, St. Jacques’ second mount, took home the third place prize after earning scores of 80 and 84. Kurtz and Dreamland, an entry of Linda Evans, rounded out the top four. Kurtz first rode All My Love two years ago in the Green Large Pony Hunters. After separating for a year, Kurtz started riding All My Love again a few weeks ago. Despite little practice time, Kurtz was ready for today. “I’ve shown All My Love on the grass before so that was a big confidence boost going into today,” Kurtz explained. Tomorrow Kurtz will return to the show ring in the Junior Hunter divisions. The second class on the field was the $5,000 “Jump for the Children” Medium Pony Hunter Classic. Fifteen riders completed the first round and those with the top 11 scores came back to jump a second course. Mimi Gochman, from New York City, and David Gochman’s pony, True Love, entered the second round in first place with a score of 87. The pair held on to their lead, earning a score of 85, giving them a grand total of 172. Finishing just three points behind Gochman was Farah Rizvi and Trillville. Rizvi turned in consistent performances in both rounds earning scores of 84 and 85. Sophia Calamari and El Nino took home the third place with a grand total of 157. Erika Luter and Elegance rounded out the top four just one point behind Calamari. While Gochman enjoys competing in the traditional hunter rings with True Love, the change of venue provided for an exciting experience. “It was really fun to show on the field because there is so much space and it is so pretty,” Gochman remarked. Zayna Rizvi and Peacock Ridge LLC entry, Rollingwood’s Knee Deep, topped the field of 21 competitors in the $5,000 “Jump for the Children” Small Pony Hunter Classic. The pair was ahead after earning a first round score of 88 and secured the blue ribbon with a second round score of 85. Rizvi’s second mount, Sandcastle, owned by Richard Cunkle, finished the first round in seventh place. In the second round, Sandcastle and Rizvi earned a score of 83 to put them in second place overall. Tessa Brown and Land’s End Lady Slipper finished one point behind Sandcastle to take home the third place prize. Kate Taylor and Clovercroft Love Bunny rounded out the top four. The EnTrust Capital Small Junior Hunters 16-17 will award championship honors tomorrow in the E. R. Mische Grand Hunter Ring. The 372,000 FEI World Cup™ Grand Prix CSI-W 5*, presented by Douglas Elliman Real Estate, will be featured in the International Arena at 7 p.m. For full results and more information, please visit www.pbiec.com.